Flip Out Mama: Dr Suess' Holidays On The Loose coming December 18, 2011! Dr Suess' Holidays On The Loose coming December 18, 2011! DR. SEUSS’S HOLIDAYS ON THE LOOSE! BURBANK, CA (October 12, 2011) – The Grinch, the Cat in the Hat and many other legendary literary characters come to life on Dr. Seuss’s Holidays on the Loose! a new release from Warner Home Video (WHV) available on DVD October 18, 2011. This set will feature three Dr. Seuss specials plus bonus features and will retail for $26.99 SRP. Also available to consumers from WHV is Dr. Seuss’ How the Grinch Stole Christmas! in a deluxe edition on Blu-ray™ disc. This title will retail for $24.98 SRP. Celebrate that special time of year with Dr. Seuss’ magical stories. Just in time for the gift-giving season, Dr. Seuss’s Holidays on the Loose! offers consumers the perfect collection of iconic classics in an all new gift set that is sure to captivate both kids and adults alike. How the Grinch Stole Christmas! –“Every Who down in Whoville liked Christmas a lot.” And every family likes How the Grinch Stole Christmas! a lot! Based on Dr. Seuss’ beloved book, this joyous, heart-tickling holiday event which features the voice of legendary actor Boris Karloff, has delighted all ages since its 1966 debut. Can the Grinch steal the town’s holiday spirit by stealing their holiday treats? Or does Christmas…perhaps…mean a little bit more? The answers to those questions unfold charmingly under Chuck Jones’ pitch perfect direction. The Grinch Grinches The Cat in the Hat – What happens when the mischievous Grinch decides to wreak havoc on the world but the happy and ever-so-delightful Cat in the Hat stands in this way? The result is a triumphant story of an unlikely hero who uses a little caring and compassion to help save the world from an unfriendly and unbeautiful future. Watch and see if the Cat in the Hat can go from peaceful picnic in the shade to helping the frightfully mean Grinch turn a new leaf. This special earned an Emmy® Award for Outstanding Animated Program in 1982. Halloween is Grinch Night – The sinister Grinch who stole Whoville’s Christmas is back to declare Halloween as “Grinch Night!” While the Whos are caught in a horrible storm of Sour-Sweet Wind, the Grinch and his trusty pooch Max, take this opportunity to terrorize the little town. Unfortunately for him he is surprised by a young boy whose unexpected courage prevents the Grinch from unleashing his awful horrors onto their tranquil town. Grinch Night will never be the same! This special earned an Emmy® Award for Outstanding Children’s Special in 1978.
ó From Whoville to Hollywood – A rapping, rhyming chronicle of the original book and this beloved animated adaptation. ó Songs in the Key of Grinch – Interviews with composer Albert Hague and vocalist Thurl Ravenscroft. ó Who’s Who in Whoville – Biography Gallery. ó Grinch Song Selections – Go right to your favorite songs. Includes: Opening Song, Trim Up the Tree, Welcome, Christmas and You’re A Mean One, Mr. Grinch. ó TNT’s How the Grinch Stole Christmas Featurette – With Phil Hartman. Now available on Blu-ray™, Dr. Seuss’ How the Grinch Stole Christmas! 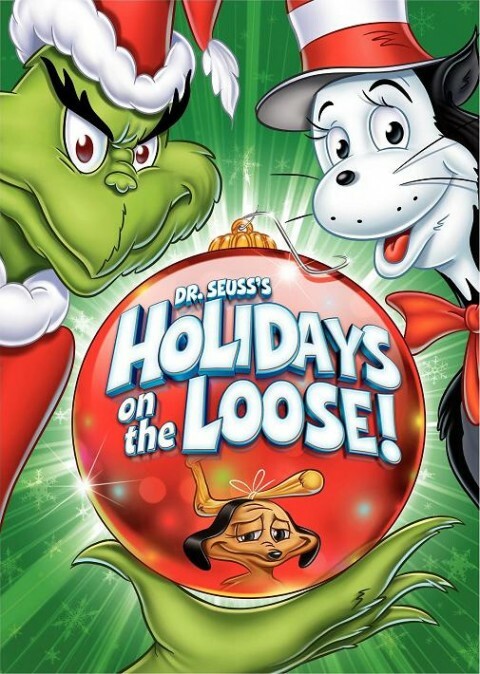 tells the story of how the Grinch, a bitter, cave-dwelling creature, attempts to sabotage Christmas for all the merry and warm-hearted denizens of Whoville. Dr. Seuss’ How the Grinch Stole Christmas! is narrated by Boris Karloff (Frankenstein, The Mummy) and directed by animation legend Chuck Jones (Looney Tunes, What's Opera, Doc?). The story was originally adapted to television from the 1957 children’s book, as an animated TV special and was highly praised by audiences and film animation fans alike. It has been re-broadcast numerous times since its debut, with annual airings continuing to the present day. The original book was considered among one of Dr. Seuss’ finest works for children. With operations in 90 international territories, Warner Home Video, a division of Warner Bros. Home Entertainment Inc., commands the largest home entertainment distribution infrastructure in the global video marketplace. Warner Home Video's film library is the largest of any studio, offering top quality new and vintage titles from the repertoires of Warner Bros. Pictures, Turner Entertainment, Castle Rock Entertainment, HBO Video and New Line Cinema. Warner Bros. Home Entertainment Group brings together Warner Bros. Entertainment's home video, digital distribution, interactive entertainment/videogames, direct-to-DVD production, technical operations and anti-piracy businesses in order to maximize current and next-generation distribution scenarios. WBHEG is responsible for the global distribution of content through DVD, electronic sell-through and VOD, and delivery of theatrical content to wireless and online channels, and is also a significant worldwide publisher for both internal and third party videogame titles.